To disable click sound on Windows 7 when clicking link eg navigation click, please open the "Hardware and Sound" to change the system sounds in Win-7. This solution Is also for the Internet Explorer 8.0 and Server 2008, 2012! the option "Change system sounds"
"Start Navigation" and set to "None"
Windows-7 - FAQ-20: Disable sound on Windows 7 when clicking link eg navigation click sound? How to stop noise on windows 7 internet links? Turn of sound in windows 7 when click? Disable ie sound in win7? How to stop clicking in page turning with win7? Remove window 7 click sound? How to turn off windows clicking sound? Win 7 sound on click? How to turn off mouse click sound windows 7? Remove click sound windows 7? When moving mouse it makes a sound on windows 8? How to turn off windows 7 sound scheme for outlook? How to remove sound in folder click event in windows 7? How to delete start.wav windows navigation start win 7? How to mute mouse click sound in windows 7? Turn off clicking sound internet explorer windows 7? How to remove clicking sounds windows 7? Turn off internet explorer click sound windows 7? On-screen keyboard remove click' noise? Disable mouse click sound windows 7? How to turn off the clicking sound on internet explorer with windows 7? Removing system sound for windows ultimate? How to stop clicking noise in windows 7? Windows 7 remove click sound? Windows 7 click sound disable? I want to disable click navigation sound on Windows 7? Turn off. keyboard sound win7? Mematikan sound open windows 8? Turn off sounds from mouse in windows 7? Mouse click sound for windows 7.exe? Windows 7 noise when clicking? Remove mouse click sound windows 7? Turn off sound for file select in Win7? How to turn off the clicking sound on windows 7? Ventrilo 64x windows 7 can't stop key click tone? Windows explorer sounds turn off? Stop click sound Windows 7? How to disable clicking sound in windows 7? Change sound scheme windows 7 cmd? Disable clicking sound in windows 7? How to turn on click links on windows 7? How to Disable Start Navigation or the Clicking Sound in Internet Explorer 8 or 9 in Windows 7? Can I disable Click event for links in Windows 7? Can I disable the clicking sound in Windows Seven via a simple method? Disable the Windows Explorer Navigation Clicks, how to? Turn off clicking sound windows 7? Turn off navigation click windows 7? Disable link click windows 7? Click sound on windows 7? Windows 7 thunk sound when clicking on items? I want to shut off the sound on windows seven when saving? Turn off mouse click sound windows 7? Remove clicking on windows 7? How do I turn off the Internet Explorer 8.0 click navigation sound ? How to disable (to deactivate) click navigation sound in Windows 7? Deactivate, Disable, or enable the Internet Explorer 8 click navigation in Windows 7? How to disable click noise in Internet Explorer and Windows Explorer in Windows 7? How do disableclick sounds on windows 7? Turn off clicking sound in windows 7? How to mute windows sounds windows 7 64 bit sound scheme? Internet explorer 8 shut off sounds windows 7? Windows 7 internet explorer 8 turn off sounds? How to turn off the click sound on windows 7? Mouse click sound windows 7? Stop muse click noise in ie on win7? How to stop the program sounds from sound in windows 7? Disable the click sound in windows 7? How to turn off sound of mouse click in windows 7? How do i turn off start navigation sound? How to disable clicking sound on ie8 when changing website? How to turn off click sound in win7? How to disable navigation sounds on desktop? How to stop navigation sound in windows xp? 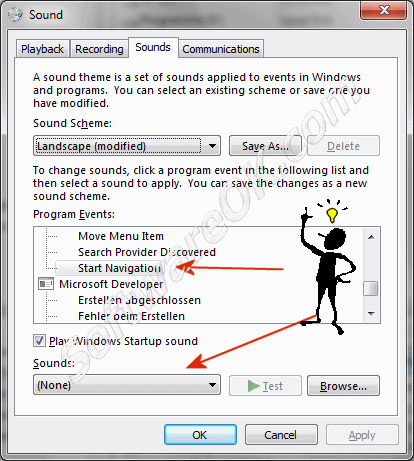 How to activate sound when i click in windows 7?